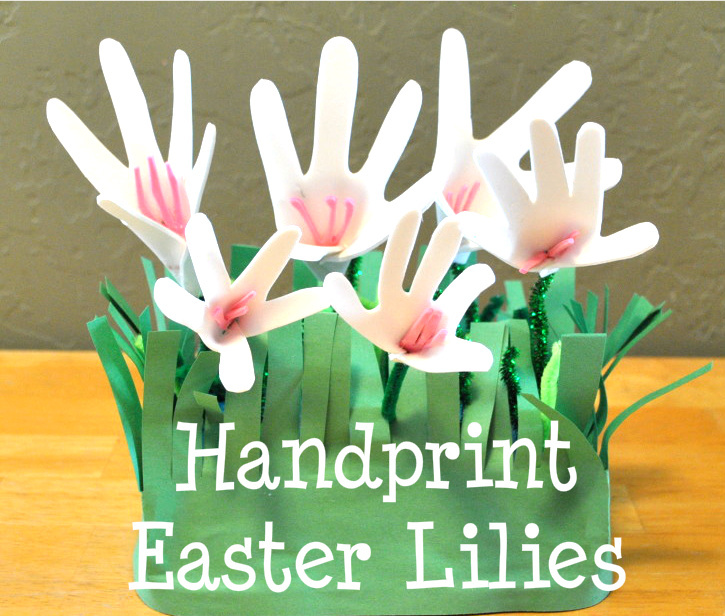 The same woman who told my MOPS group about her responsibility chart and dusting mitts, also told us about Handprint Easter Lilies. She quickly explained the concept and then moved on to other ideas, but that one stuck with me and I love how they turned out! I created an Easter Lily centerpiece for our kitchen and it has 3 lilies for Sweet P and 3 lilies for Baby Blue. 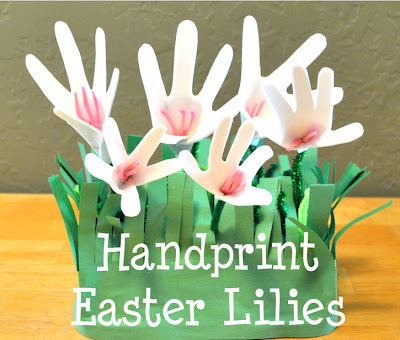 I love the idea of doing this every year and eventually having a bouquet of handprint Easter lilies to cherish! 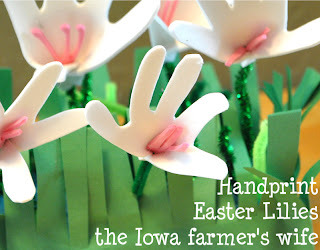 The idea is simple and a fun mom/child activity. Trace your child's hand on the white foam piece (I just press with a mechanical pencil and it makes enough of an indention to use as a cutline). Cut out handprint. Repeat if you want more lilies. Cut a small piece of pink foam and cut into three pieces to form the stamens. I used a glue gun, but other glue would work. Hot glue the stamen to the top of a green pipe cleaner, then glue the pipe cleaner to the bottom middle of the handprint. Glue one side of the handprint to the pipe cleaner/stamen, repeat with the other side so that the hand wraps together to form the lily. Fold down the fingers to form a flower. Cut a large piece of construction paper in half laterally. Using a hot glue gun (or other glue) secure the green construction paper to your base. 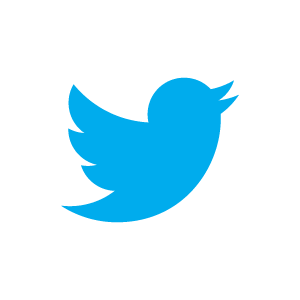 It should stand up around the edges and not fit perfectly. 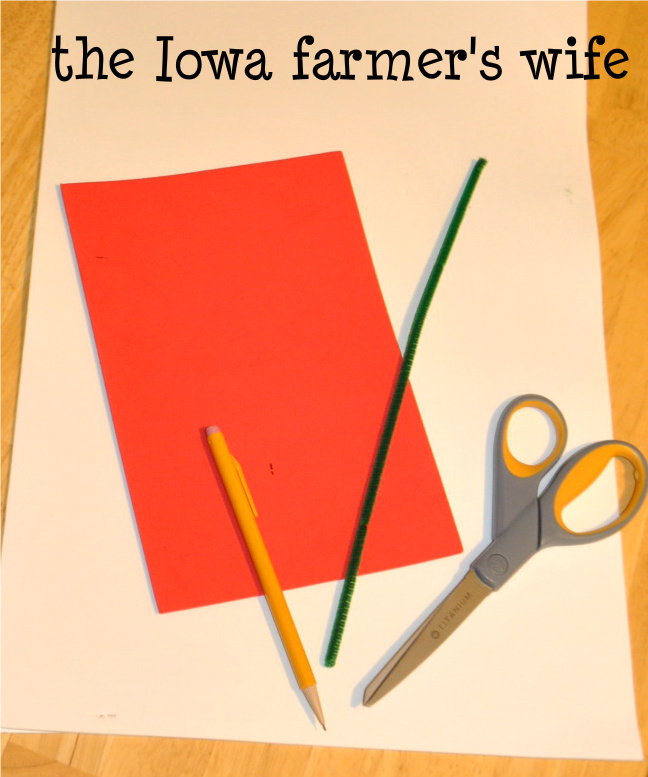 Allow to dry, then cut the tops of the paper about every inch or so to form grass (see picture). Have your child poke the small pieces of pipe cleaner into the base to add more grass. Arrange lilies and poke into grass. Wa-la! Easter centerpiece! Sweet P loves asking which ones are hers and which ones are Baby Blue's hands.